Both functional and decorative, the Tiffany Nice chandelier is an ideal object to enhance the interior with its captivating stained glass windows. 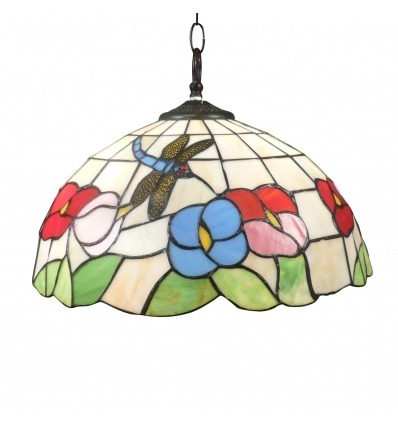 In order to significantly add a chic and vintage touch to your home, by choosing a central and personalized lighting, this magnificent chandelier Tiffany Nice is handcrafted using the original methods of the American glazier designer Louis Comfort Tiffany, with the same materials used at the time. 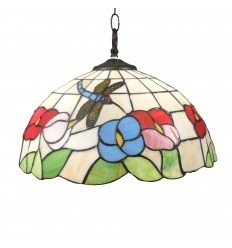 Made with stained glass in real solid glass, welded with tin, assembled by hand, it meets CE and RoHs standards (lead-free and mercury-free guarantee) for the total respect of the environment. Washbasin height: 22 cm - Diameter: 41 cm. Designed to be suspended from the ceiling, the chandelier is a perfect light to bring in your interior a central and generalized lighting. It is part of the decorations during the day and offers a magical light at night. Synonymous with luxury and refinement, these art deco lamps offer an element of undeniable décor in the heart of the house. Aesthetic and functional, the Tiffany Nice chandelier is a true work of art nouveau, inspired by the original models exploited decorative title by a creative artist of the early 1900s. This lamp Tiffany style presents a stained glass made of a wide range of handmade glasses , semi-opalescent whites, with sky blue, red, linden green, amber yellow glasses. Beautiful art deco style designsco, such geometric shapes mosaic color haunting allow the fixture to make effects to enhance your home. In addition to authentic materials, this lamp will be able to provide light-toned lighting. By associating it with a lamp, a wall lamp, or a Tiffany floor lamp of this series, you will be able to compose a harmonious whole of the same decoration and stained glass. This model is sold electrified for two bulbs of 60 watts maximum. The chandelier chain can be adjusted to a height from 105 cm to 43 cm (ceiling height - low gloss).